NEW! Illuminated manuscripts were decorated with beautiful "illuminated" (gold and silver) initials, decorations and pictures. 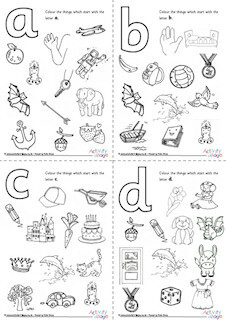 Our set of illuminated alphabet colouring pages follows that tradition, but we are providing two versions per letter - one "simple" and one more traditional - so that everyone can enjoy colouring them in. They comes as colouring cards, too, because who wouldn't want to receive one of these beautiful initial letters as a special card on their birthday or other occasion! Never be stuck for the perfect card again! Use these for writing thank you notes (with your own initial) or as birthday cards for someone special (with their initial). Anyone whose name begins with the letter A is sure to appreciate this lovely colouring page in illuminated letter style! There are two versions to choose from. The first, pictured, has lots of detail. We think both kids and adults will enjoy colouring in this gorgeous illuminated letter H colouring page. We've got two versions to choose from too: a very detailed version for those who love a colouring challenge, and a simplified (but still very pretty!) version. Colour in this fantastic illuminated letter M card, then maybe give to someone whose name begins with M? You could also give it to your Mum/Mom for her birthday or Mother's Day. Choose from one of two versions below (simple or more detailed).